A well trodden route therefore excellent path all the way. The gradient of ascent is quite steep at the start of the climb but eases at Townend Knotts. 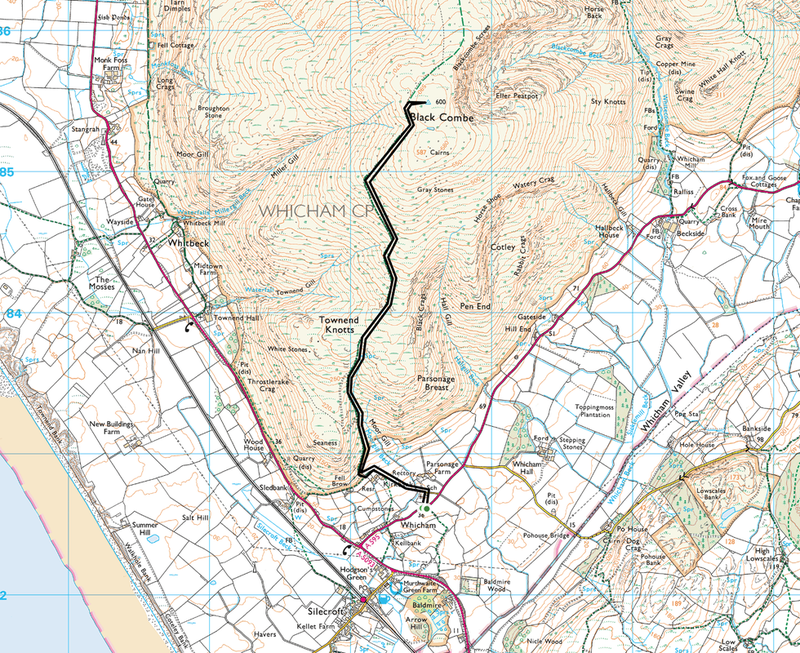 At 1970 feet Black Combe is no pushover and whilst the ascent eases after Townend Knotts this is still an energetic walk which should be undertaken in good weather in order to appreciate the fine views that this lofty summit grants you. There is a lay-by near the path with room for a few cars. The path leaves the roadside and starts to steepen once you are clear of the farm buildings. There then follows good walking on an excellent path all the way to the Trig Point on the summit. The same route was used for the descent. Whoops! Shocking spelling on the sign at the start of the walk. Looking south to the Duddon Estuary from near Townend Knotts. Walney Island and Barrow in Furness are in the distance. Cracking view from the summit. The Coniston Fells are in the centre. Black Combe Summit Trig Point and Shelter.